Seaweed – Valuable Input or Expensive Luxury? With little else to do as our meadows here are blasted by Easterly winds, and temperatures so low that nothing’s really growing, I decided I could at least scatter some seaweed meal on our fields. There’s no question it’s an expensive product, but having experienced what I consider to be real visible benefits from using it around the garden, I thought it was worth trying it on at least some of our meadows. I’ve come to realise in our few years of working towards greater floral diversity, that conventional NPK fertilisers are real no-no’s, and that you also have to be very careful with much manure, which we don’t have access to anyway.. But given our very high annual rainfall, and regular cropping by sheep, or indeed as hay, it seems rational that one should return some nutrients to the land or risk significant depletion – particularly of trace minerals or other micro-nutrients, without which our sheep, and indeed some plants might suffer. 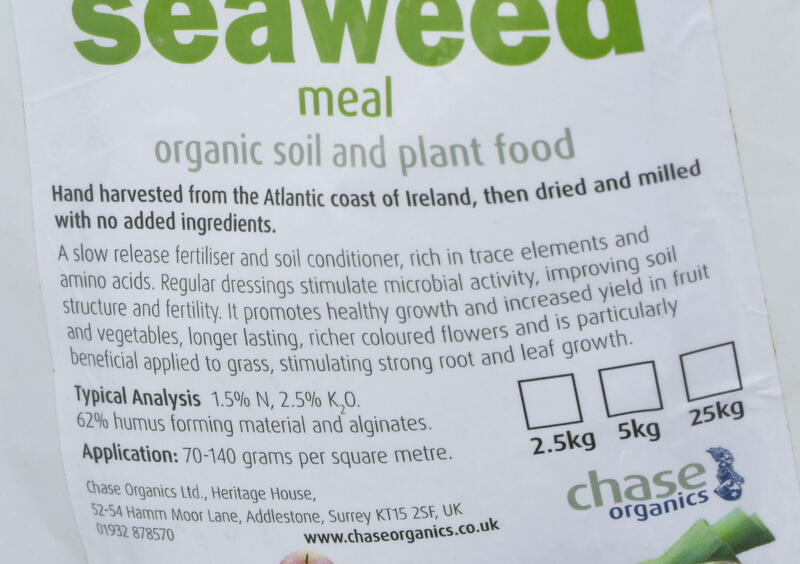 Seaweed meal seemed the obvious answer, since it contains a huge range of micro-nutrients as well as a very different, mainly alginate based, organic mix of complex molecules. 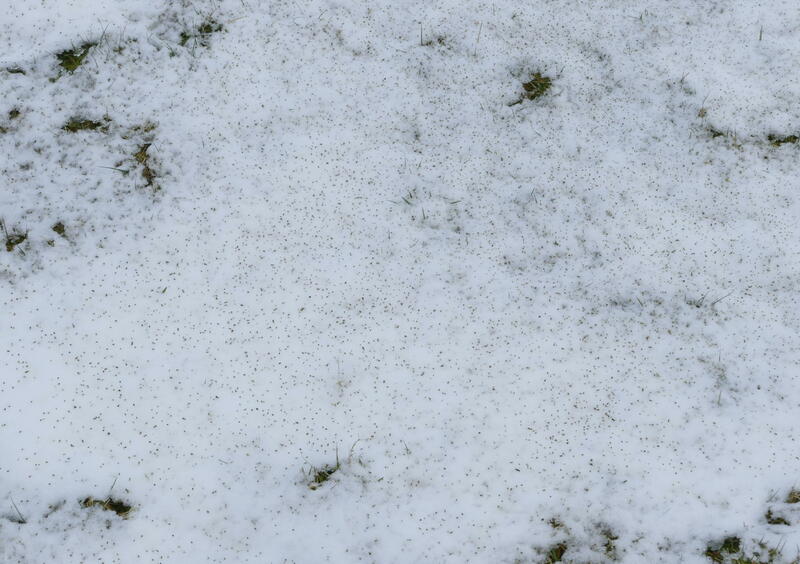 I’d also noticed that it takes a long time to break down – so it can be viewed as more of a slow release fertiliser, which is why I took the opportunity of the recent snow covering to scatter it on those 3 fields I’ve opted, for now, to spread it on. It’s then quite easy to see how you’re actually distributing it. It’ll be some weeks before the nutrients begin to break down and reach root level, by which time the grass should be growing more strongly. Quite unlike the quick fix of highly water soluble conventional fertilisers. It’s impossible for me to comment on how productivity, or indeed diversity has been affected – all I can say is that in the last 2 years, numbers of orchids and wax cap mushrooms in these fields continues to increase significantly, and the hay has seemed great, if we can manage to crop it dry… In addition our subjective assessment is that the flavour of our lamb has improved over the last few years, though this may just reflect the wider range of plants now growing in the meadows. It’s possible, I guess, that if there are improvements in plant flowering, then there might even be nutritional advantages in pollen and nectar produced from meadows treated in this way, which might benefit the pollinators visiting our meadows. So is it worth doing? I did a quick calculation that at the suggested rate of application given on the bag, you’d need about 10 X 25 kg bags per acre !! This seems a bit beyond “micro-nutrient” application. I put on a tenth of that, so maybe my usage is more homeopathic in nature? But as you can see, if you scatter it by hand in very high winds, you can get a widespread, diffuse distribution, and it takes about an hour to manually cover an acre in this way. So it’s a low tech simple way to distribute the product. At about £40 per bag, it’s very difficult to justify in any commercial way – unless of course long term the herbage and meat quality improves dramatically. This is written as a teaser article – there is now quite a lot of material available on line about potential benefits of seaweed meal, although not surprisingly much of it written by seaweed producers. I should perhaps add that the only other material we have ever applied to our meadows is ash from our wood burning stoves – scattered in a similar way, and which will have a low level of K input, but minimal N and P (which can both be potential problems with too much manure) with also some short term alkaline effect on pH, though this will be leached out quite quickly. How many other readers have any experience of using this, or other supplements on their fields, or are they all zero input? This entry was posted in Meadow Flowers, Nature, Wildflower Meadows by earlypurpleorchid. Bookmark the permalink. Very interesting communication, this was something I struggled with when I was organic. It was suggested by Prince Charles farm manager at one of the annual SA conferences I went to, Mr Wilson, that I try giving whole oats and seaweed meal to the lambs to finish them for the mart supplying general nutrients and trace elements, minerals, needed for growth missing from my soil (Co, Zn, Cu and Se). I did for a couple of years, they accustomed themselves to eating it though if it rained it became a blackish soggy mess and I had to clear it out of the trough. I had seen seaweed used on the lazy beds in the Hebrides and there was at one time a large industry of seaweed gathering in the 19th C in the Outer Hebrides. I heard that there is elevated arsenic in seaweed meal, see a paper titled Arsenic metabolism in seaweed eating sheep from N Scotland which studied the North Ronaldsay sheep. I decided it was not a good idea to continue using it- one of those conundrums in organic farming that may not be so healthy after all. 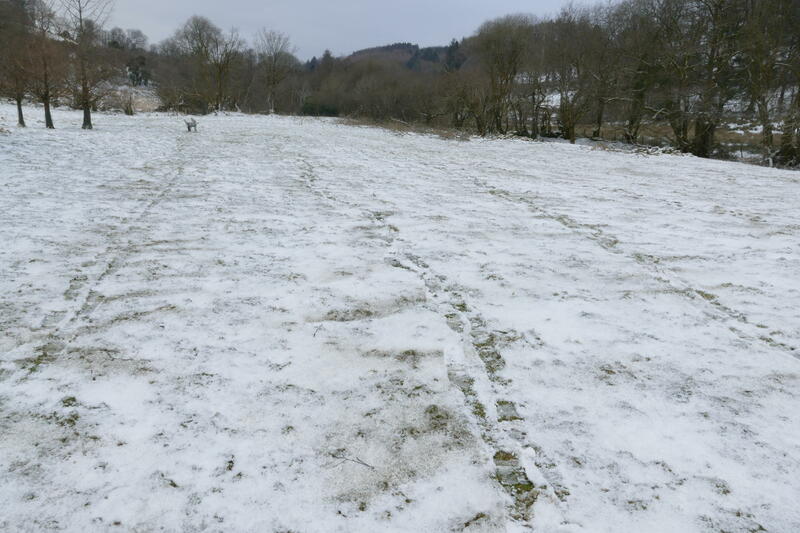 I use my wood ash as non-slip on paths and slopes in ice and snow and round the fruit trees or on the veg garden and try scattering ashes from bonfires on non-SSSI fields after coppicing hedges for example. I hope the mineral boosted excretions from the livestock (from licks or agri-lloyd supplements) gradually increases the trace elements in the top layer of soil. I think this is very slow though. Another consideration would be to use an application of ground crushed basalt to supply trace elements and minerals over a long time. Important in our vegetable gardens but too expensive on the field scale I should think. ADAS suggested that retention of sweet and fertile sward on upland permanent pasture could be done by over-sowing with clover and application of lime (Bronydd Mawr). I don’t think that grazing by sheep depletes fertility, I read that the balance of N in and out of grazing animals is more or less equal except when they are growing when there is a net loss from the field, also of P etc. In fact in the very long term the organic movement suggested that loss of P would be significant on upland permanent pasture. I don’t use NPK. I only apply manure to the hay fields. Weeds such as nettles and creeping thistle have been problematic where too much fertility. I hope this is not too long in response but it has been so important in my experience here. Thanks Ruth for all this additional information and experience. I had indeed also thought of doing some sort of trial using crushed rock, which seems to be about half the price of seaweed extracts. Part of the problem for a smallholder is that to get any meaningful detailed mineral analysis done is in itself quite expensive. The paper I give the link to, suggests that the benefits of seaweed are now thought to be way more complex than simple trace mineral supplementation – possibly a consequence of the large proportion of alginates in the meal. Towards the end of my career, I had a couple of very dramatic and unexpected medical improvements after the use of an alginate containing product – again entirely anecdotal, but so unexpected I suppose I’ve always wondered what benefits they might have on plants/pasture. The arsenic issue is a possible worry – but again I do wonder how much trace mineral analysis is ever conducted on the food ( particularly of the processed kind) which the average human takes in on a daily basis? I am sure there are important other nutritional properties of seaweed besides trace elements – variable according to species and perhaps where collected (the underlying rock they grow on). I am sure there is a real future prospect for nutrition from cultivated seaweed (algae) as opposed to fibroblast or muscle cells which I think is a con (they require foetal calf serum). 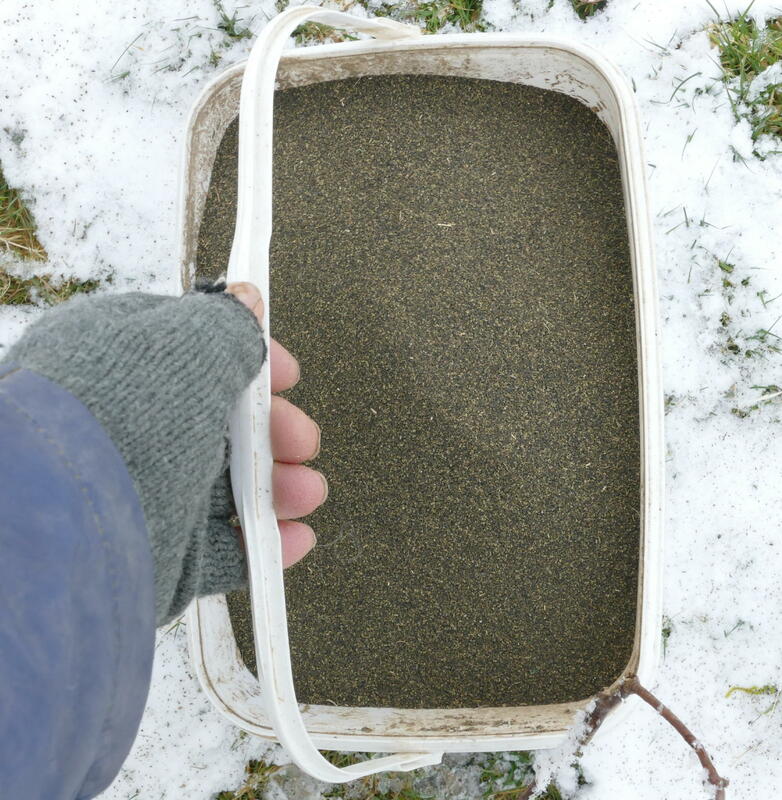 I forgot to mention that after the 2 years of supplementing the finishing lambs by adding seaweed meal to their troughs of whole oats I got TES services to test my soil in detail in 3 hay fields and I added the trace element mix he prescribed onto the flat non marshy fields ie not the SSSI. I expect it was a mix of inorganic trace element compounds that was fairly standard for Old Red Sandstone. I think their beneficial effect had gone in 2 years washed out. The previous farmers had spread calcified seaweed and oversown with white clover a few years before I bought the farm as they planned being organic which I took up. The organic consultant I was advised to employ suggested I put gafsa, mylonite and lime ( I did not put on enough to bring it up to PH 7) and a few years later I spread dolomitic lime to add magnesium on the hay fields as a cow died of staggers on one as she wouldn’t touch the bitter organic mag block allowed. By standard tests the soil had zero N and P and was PH 5.6. I don’t think anyone ever put anything on the unimproved SSSI fields which were neglected and very brambly. Apologies to Julian and others, both for the lateness of this reply and its limited relevance, but it struck me that there has been (and still is) a very long term experiment on the effects of various fertiliser treatments on grassland. I have to admit it doesn’t include seaweed meal, but I hope it will be of interest to some! Very interesting thank you, enjoyed the film. How very interesting to have worked at Rothamsted. I saw the lawn project at Nettleton a similar type of expt but on frequency of mowing. Mowing more than twice a year decreased the plant diversity of the lawn markedly. Whilst trying to improve without mineral NPK fertilisers the semi-natural fields here, increase plant diversity, palatability, and mineral health without changing the PH to about 7 so they remain with the characteristics of acid grassland I have never put anything on the SSSI fields.